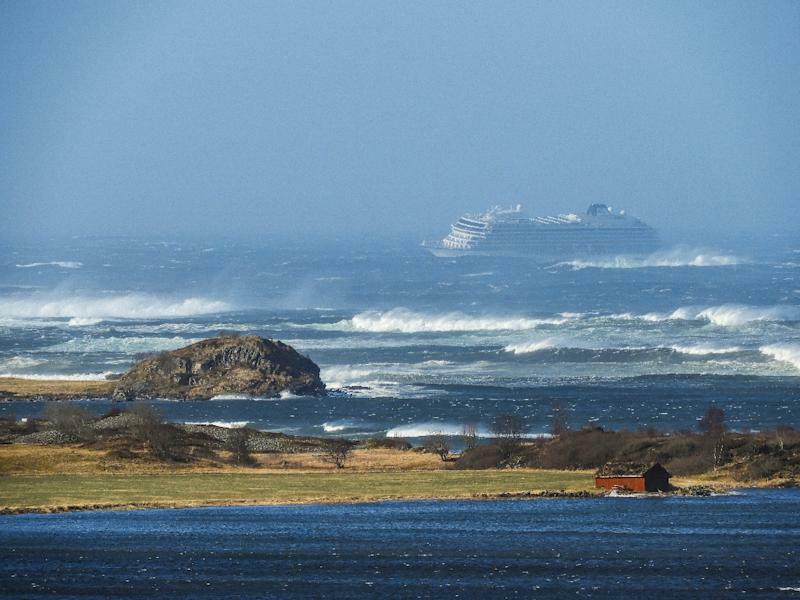 Oslo (AFP) - A cruise ship that broke down in rough seas off the Norwegian coast with some 1,300 passengers and crew on board has restarted three of its four engines and will be towed to port, emergency services said Sunday. "Three of the four engines are now working which means the boat can now make way on its own," emergency services spokesman Per Fjeld said. The Viking Sky lost power and started drifting mid-afternoon Saturday about two kilometres (1.2 miles) off More og Romsdal in dangerous waters and high seas, prompting the captain to send out a distress call and trigger a massive airlift operation. The airlift was continuing in the early morning, Fjeld said. Police said 338 of the 1,373 people on board the Viking Sky had so far been taken off by helicopter. The vessel is making slow headway at two to three knots (4-5 kilometres) an hour off the dangerous, rocky coast and a tug will help it towards the port of Molde, about 500 kilometres northwest of Oslo, officials said. Police said that 17 people had been taken to hospital.